Foodista | Chardonnay and Oak. Together. Why Can't We Be Happy For Them? Chardonnay and Oak. Together. Why Can't We Be Happy For Them? Waaay too much oak in Chardonnay. If a little is good, more is better. Right? Nope. Chardonnay got to the point where it felt like you were drinking it out of a wooden cup. No acidity. You know how a squeeze of lemon brightens up food? This is what Chardonnays were lacking. Winemakers were enamored with a process called malolactic fermentation. (Oh, you didn't see me getting all Mr. Wizard on you, did you?) Basically, you take the zesty, citrusy acidity and turn it into something more creamy. Think lactic as in dairy. In contrast to this pumped-up style of Chardonnay, the MacMurray Ranch has subtle oak, decent acidity, and some real character. It's balanced enough to drink on its own or would pair nicely with chicken, pork, or richer seafood dishes. 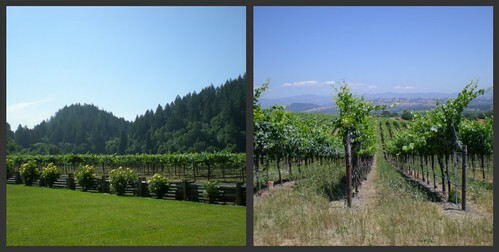 And, as you can see in the above photos, MacMurray Ranch and the surrounding vineyards are gorgeous. (I got a chance to go there last year on a trip put together for my fellow grocery store wine brethren.) Fred MacMurray (yes, that Fred MacMurray) certainly knew a good thing when he saw it. And I think he'd continue to be proud of the unassuming, well-made wines (especially the Pinot Noirs) that carry his name. I somehow managed to be in the 99% of people who didn't start drinking Chardonnay as their white of choice. I think it maybe because I lived in Italy when I started drinking, but even when I returned to the U.S., there was a lot of Pinot Grigio going on. To this day, apart from the odd bottle guests bring to parties, I have always gone with other grapes (Albarino, Viognier). Not quite off-the-grid enough to qualify for that indy card, but enough to keep my friends interested and discovering new things. Nice post, Jameson! I have to admit I was delighted to find Viognier entering the Washington wine scene a few years back so that we could have another alternative to Chardonnay. These days I'm finding I enjoy Chards that are half oaked and half unoaked. It seems to strike the right balance for my palate. Although, when I have crab cakes I really crave one of those more traditionally buttery Chards to match the food. I am with you, too much oak is not good for a chardonay...audrey hepburn all the way with this wine! Albarino totally gives you indie cred. It's great that you are willing to experiment and try new things. Thanks for the comment! I wish Washington winemakers would treat Viognier differently; I feel it's all oak and high alcohol. Sometimes it's hard to distinguish Viognier from Chardonnay,except for some more compelling, floral aromas. I totally agree with crab (cakes) and a more butter Chardonnay; it definitely has its time and place. Do you have a crab cake recipe on Foodista? Breakfast at Tiffany's with a nice, unoaked Chablis!